It may be a big holiday week and the end of the year, but there has still been some news on the government ethics front. The Boston Globe has called for the state to institute disclosure requirements for local lobbying. According to the editorial, the only rule now is to file a letter with the Boston city clerk when lobbying the Boston city council. One letter about whom is represented and what the nature of the business is. You can lobby the Boston mayor and any board or agency without notice, not to mention the other cities and counties in the state. That doesn't cut it, at least according to the Globe editorial board. According to an article in the Inlander, the Spokane council will soon vote on ethics reforms that will give more powers and jurisdiction to its ethics commission. It will have the authority to subpoena witnesses, as part of a new complaint process, and there will be enhanced training and more clarification regarding gifts and conflicts of interest. An article on the syracuse.com website tells an all-too-typical story of the poor handling of a conflict of interest in a poor local government ethics program (as most are in New York state). The live-in boyfriend of the Cicero, NY town supervisor, an elected administrator and member of the three-person town board, works as a "senior principal" for a company that serves as the town engineer. As a town board member, the supervisor voted three times to contract with the company. The matter came before the town ethics board, which found that she had a conflict and should have withdrawn from participation in the matter. So far so good. The investigation began in April and the board's decision on December 10 was given to the town board, which refused to make it public (somehow the newspaper got a copy of it anyway). Not only did it take six months to investigate a simple conflict situation, but the board's decision was only a recommendation . . . to the board chaired by the respondent. Considering that the town board is itself conflicted and the supervisor says she welcomed the investigation, the last thing the board should have done was refuse to make the ethics board's recommendation public. The other major problem is that, according to the supervisor, she had acted on advice from the town attorney and from the district attorney's office. Neither of these offices should have provided this advice. This advice should have come from the ethics board. If the ethics board is permitted to provide such advice, then the town attorney should be severely reprimanded for providing advice (the district attorney is outside the town board's jurisdiction; he or she should be told to keep his or her nose out of town ethics business). If the ethics board is not permitted to provide such advice, then the town attorney should be held accountable for improper advice. He should be required to apologize to the town at the next town board meeting and to take an extensive government ethics training course. But the best solution is for the ethics board to be given the authority (and the funds) to hire an on-call government ethics adviser to provide ethics advice to town officials and employees, and to the ethics board itself. 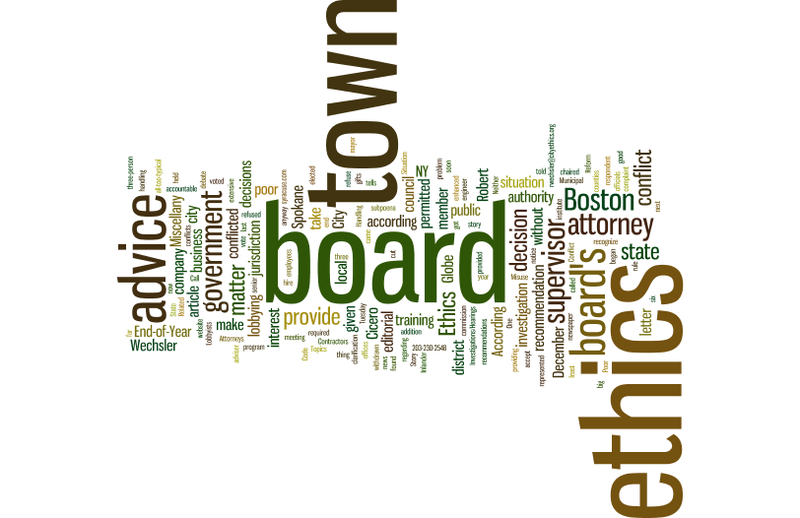 In addition, the ethics board's decisions should be decisions, not recommendations to the town board. The town board should recognize that it is conflicted in this matter, accept the ethics board's decision without debate, and change the law so that this situation cannot arise again.